We bought our Elf on the Shelf back in 2013, after I learned about the tradition on Pinterest, and you can see some of his adventures here. Although our Elf comes from the North Pole with Father Christmas, he isn't spying on the children to make sure that they are behaving, he just likes having fun while they are asleep and hiding so that they have to find him the next morning - the children love coming down in the morning to see what he has been up to! Over the last few years, the Elf tradition has really taken off, and now in addition to the classic blue eyed boy scout elf you can also buy a girl scout elf and they are available in different skin tones with different eye colours. We now have a boy and a girl elf, and the children love having one of each. Because they are so widespread now, I think that it's nice to come up with ways to customise your Elf, especially if your child will be visiting other homes with the same Elf, to keep the magic alive and help them believe in their own individual Elf. There are lots of ways that you can do this, and so I've gathered together a few ideas for making your Elf a unique part of your family. 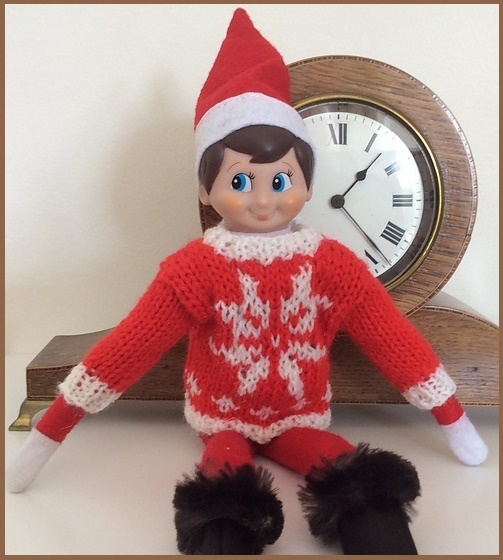 One lovely way to personalise your Elf is to make him some clothes. 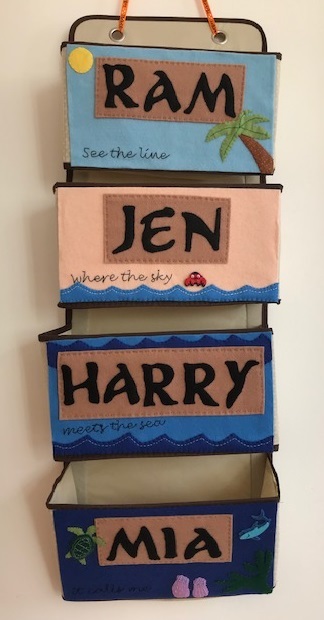 My Mum has developed some gorgeous knitting patterns, and for just $6 (about £5) you can purchase a set of three very different patterns so that you can make him or her their own little sweaters. I think they are lovely! 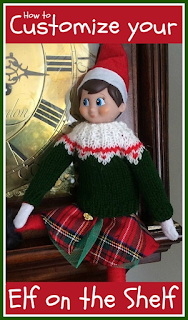 The pattern is here - Sweaters for Santa's Elf Helper. Our Elf returned from the North Pole one morning last year wearing one of these knitted jumpers and the children were delighted. My knitting skills aren't quite up to making a jumper, but last year I set the Elf up one morning with a crochet hook and some yarn, and over the course of a few days she managed to crochet herself a whole scarf which looked really good. Even if you are only a beginner knitter you could easily knit a scarf for your elf, you only need to cast on a few stitches and knit enough rows to wrap around his neck a few times. If you really want to hack your Elf, then you can make him more bendable by inserting some wire inside him. There is a fantastic tutorial here - How to make your Elf on the Shelf Bendable - and although I've not tried it myself it doesn't look too difficult and it means that you can come up with some much more interesting poses. By adding magnets to your Elf's hands they can attach themselves to objects like radiators and the fridge, and grip things between their hands. With this hack - Elf on the Shelf Magnet Mittens - your Elf can temporarily have magnetic hands for special occasions. I love the idea of making your Elf a special corner to live in. Over at Elf Magic you can find a free downloadable template for an Elf Magic Bed in a Box which is very sweet. Once you've assembled the basic cardboard bed you can customise it by making a pillow and blanket for your elf, or you can slot it inside a shoebox to make a whole room for your Elf which your children can decorate by drawing little pictures and making Christmas accessories. You can also easily use bits and pieces from around the house to make furniture for your Elf - like this lollipop stick table and chairs. The children will love helping to make things like this, and then seeing the Elf enjoy using them in the run up to Christmas. You could also sew him a sweet little sleeping bag like this one - Elf on the Shelf DIY Sleeping Bag - a really simple project and a great way to use up a few scraps of festive fabric. Last year I turned our elves into Minecraft Santas using this free printable - Elf on the Shelf Minecraft printable. The children loved it! You can also turn your Elf into a Minecraft Creeper with this Creeper Head for Elf on the Shelf printable, also a lot of fun. I hope that you like these ideas and that they give you a bit of inspiration for your Elf this year. Please do share any other ideas in the comments! Thank you! My children loved the Minecraft heads last year, they thought they were hilarious!